Yesterday was the National Residency Match Day (always the 3rd Thursday in March) and I successfully matched at my top choice program – Loyola University Chicago’s Anesthesia Program! I’m so lucky to not only be training at such a great program, but also to keep my home nearby, for my husband to keep his steady job, and to be able to move forward with preparations for our next big adventure (our Baby Girl due in June). As an added bonus, several of my classmates also matched at Loyola and I’m looking forward to spending a lot more time with them! They are all wonderful people who I’m looking forward to working with. I’ve been eying the Purl Soho/Purl Bee Toadstool Rattles for a long time and now I have an excuse to make a few! Plus, a friend of mine said she’d be willing to part with some sock yarn scraps, so I’m hoping that I can make ones that are extra psychedelic looking. I’ll make sure to post once I get them cast on. This Domino book advises me to try to apply some labels to my style. I feel like I’ve spent most of my adult life in school and on a low budget, so I often eschewed style for functionality. I’m still very compelled by functionality, but over the past 5 years, have tried to focus on the longevity and appearance of our home wears. I like reusing and re-purposing items. One of the things that I really likes about my parents’ home growing up was that my friends often said that they instantly felt at home there. It was comfortable, without a lot of “off limits” spaces. There were no white couches or rugs. If you spilled something, it wasn’t irreparable. The house felt very lived in. One of the things that I like is mixing modern with more traditional styles, but I tend to err on the side of traditional. One of the things that I’m realizing is that in living with a man who is very conservative in his style (opting for the most boring, most bland option) that I have not been as adventurous as I would be were I out decorating a place on my own. Fortunately, my husband recently admitted to me that he trusts me to make these kinds of decisions because even when I pick a wall color that he thinks will be awful, he ends up liking it. So, whew! I’m going to take that as a blank check to be a little more unconventional and dramatic with my design choices. I’m trying to lean towards more “green” choices (my re-purposing kick always helps), but I simply can’t afford to go crazy with it. Mostly, I plan to focus on finding reuseable items and them investing in a few nice pieces. We are in a big transition time in our life. Not just the baby on the way, but also the impending Match (the process by which medical students are matched with residency programs). At this point, the most likely contenders are programs in Chicago and Southern California. If we match in Chicago, then we will continue living in our awesome house. It’s a 1926 Bungalow. We’ve done quite a bit of work on it over the last 2.5 years that we’ve lived here (remodeled the kitchen, removed wallpaper, painted like crazy, etc. ), but there is plenty more to do if we will be spending at least 4 more years here (the length of an anesthesia residency). Last night over dinner, DH and I started making a list of possible updates to the house. There are some big things that need to be addressed, such as “will we remodel the basement?” and “should be try to convert our faux fireplace into something that actually emits heat?” There’s also painting to be done and furniture to buy. Additionally, I really want to do a better job of decorating. The dining room really needs some attention and the family room/living room/den also needs some TLC. It’s amazing how expensive things are. Even when it’s worth the investment, I often find myself balking at the prices of various objects and services. 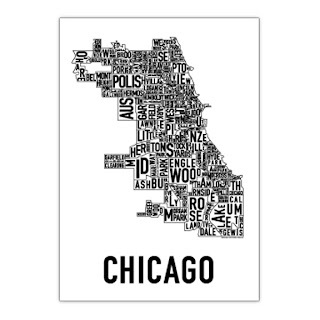 Such as, framing art… We have a great Ork poster of Chicago and it is in terrible need of framing. I love the poster and I know that I will love it even more when it’s framed, but I just know that the sticker shock will be painful. But, whatever, I need to just bite the bullet so that I can actually ENJOY my purchase! I recently purchased the Domino Book of Decorating to help inspire my to update the house. I was very sad when Domino magazine went under, so I’m glad that they left this great book for posterity. The other two books that I reference periodically are Martha Stewart Living’s Good Things for Organizing and Good Things: A Collection of Inspired Household Ideas and Projects. As DH and I decide what to do in our home, I’m trying to spend more time looking for inspiration. There are some big things that I’m hoping to accomplish before June when the third member of our family arrives. Plus, I’m guessing that this is also a great opportunity to start the baby-proofing process. My DH’s parents both grew up on farms and so when I was searching on Ravelry for bunting patterns, I thought this one would be fantastic, not to mention funny. 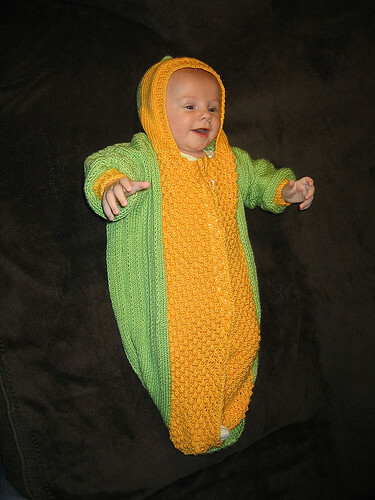 I’m making the 3-6 month size so that it’s wear will coincide with Halloween and harvest time. Unfortunately, the gauge wasn’t working out because this yarn is worsted, rather than sport weight. So, I just adjusted the pattern instead. I’m also adding a hole in the back for a car seat strap to go through. In the front, it will just go through the snaps. I hope my baby is as cute as the one in this picture! I picked up one of these Kikkerland Campfire Tea Light on clearance at the At Institute of Chicago. Love it! I’m planning on putting it in the baby’s room.